If you have grown up in a strict Indian household, you know things are difficult. Most of your times, you find yourself taking permissions than actually going out and having fun. Drinking and smoking are among the ultimate vices for parents. An Indian girl who tried to have shots in front of her parents in Ohio, US was immediately sent back to the home country! 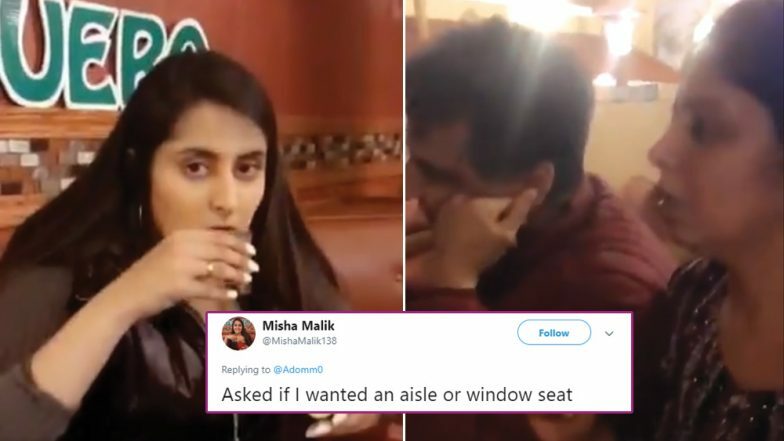 The girl named Misha Malik shared a hilarious video on her Twitter, which showed her parents too shocked to see their daughter down a shot like a pro! The video is now going viral and people can totally relate to the girl. Desi Ghee Repackaged As ‘Grass Fed Ghee Oil’ by LA Company Makes Twitter Go WTF. It so happened that the mother told the waiter it was Misha's 21st birthday. The waiter got a shot for her instead of a dessert as the mother expected. Misha took the opportunity to down it anyway. The video shows Misha downing a shot and also squeezing a lemon into her mouth after she takes it. Her parents sitting in front of her are visibly shocked and it is indeed funny. The video has her mother saying, "Misha nahi" stopping her daughter to try it. But just as she gulps it down and takes the lemon, the mother stares at her with a shock! Misha in her tweets told the users that her parents decided to book her tickets to India right away! #90sKidsRumors is Trending on Twitter and These Tweets Will Surely Make you Nostalgic of The Good Old Days. This video has been watched over 5.5 times and others have commented on how relatable it is. 😂😂😂😂😂😂😂😂😂 Oh this is gold. Their reaction is just everything. This is pure gold. The video has got several funny comments and people are especially talking about the mother urging her daughter to not do it. When one of the users commented about expecting a flying chappal at her, Misha replied that she did receive it but off the camera. Well, Indian parents never fail to surprise us. We are sure many people can relate to the situation Misha has been through.